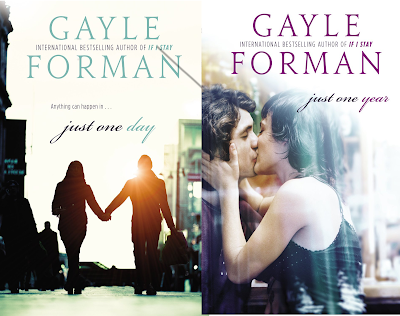 According to The Hollywood Reporter, Universal has optioned Gayle Forman's duology Just One Day and Just One Year, with plans to combine them into one movie. Also, Fake Empire is set to develop, and Gayle Forman will executive produce. Fake Empire was formed by Josh Schwartz and Stephanie Savage, who also developed Gossip Girl. Josh Schwartz also created and executive produced The O.C.. I'm so excited about this as The O.C. and Gossip Girl were both guilty pleasures of mine during high school and college. Just One Day is the story of Allyson Healey's European vacation, where she meets and spends a day with the unpredictable and carefree Willem. Just One Year picks up somewhat during the middle of Just One Day and is Willem's story. Gayle Forman's If I Stay hit theaters this summer and will be released on DVD on November 18, 2014. I LOVED If I Stay, even though I don't usually enjoy sad books. I really liked the movie, too. I can't wait to see more of her books made into movies! Are You Excited About Gayle Forman's Possible New Movie?